Red-brick foundations of the Ryounkaku Tower in Asakusa were unearthed in a construction site in February. News of the discovery quickly spread, with a number of people visiting the site to catch a glimpse of the long-lost tower’s traces. According to the Taito-ku Board of Education, similar red-brick foundations were found in a construction site nearby in 1980. However, since the remains are not considered cultural property and are not in particularly good condition, there are no heritage protections or limitations to restrict the construction work. 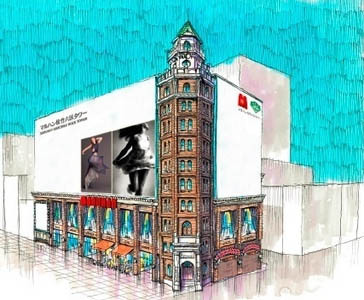 A 3-storey retail building is planned for the site. Asakusa’s Ryounkaku Tower is going to make a reappearance as a new theatre under construction will feature a facade replicating the original historic tower. The Maruhan Shochiku Rokku Tower is scheduled to open in December 2014. At 48 meters tall, it will be 4 meters shorter than the original tower. The Ryounkaku was a 12-storey octagonal tower built in 1890. It was designed by British engineer William Kinnimond Burton, who spent most of his career in Japan. The first 10 floors were brick, while the top observation floors were wood. 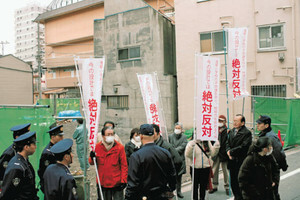 Local residents and parent-teacher-association members in Asakusa, opposed to plans for a new 13-storey condominium, have delayed the construction after protesting outside the building site. As trucks carrying construction equipment neared the site on the morning of March 1, they were met by 30 protestors blocking the entrance. The police soon arrived to assess the situation.